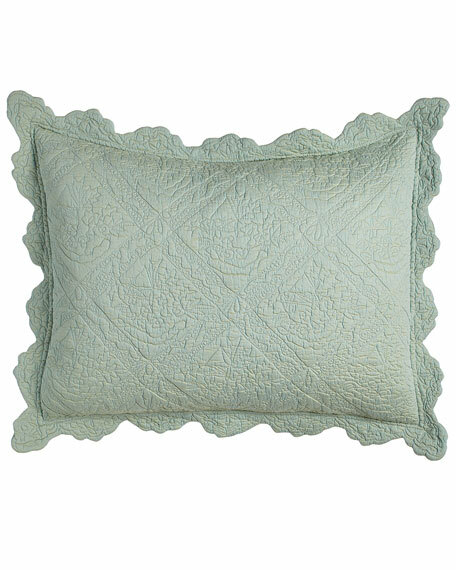 Quilted cotton with scalloped edge. Features elongated diamond quilting. Made of cotton with polyester fill. 2" flange; concealed button closure. 26"Sq. Machine wash. Imported. Made of smooth, lustrous 624-thread-count cotton sateen. Detailed with a single row of elegant hemstitching. 20" x 36". Machine wash.
Made of smooth, lustrous 624-thread-count cotton sateen. Detailed with a single row of elegant hemstitching. 20" x 36". Machine wash. Imported. Sham with 2" stitch down tailored flange and single pick stitch from the Annandale Collection. 300-thread count cotton sateen. Hidden button closure. Random cut. Machine wash. Imported. Sham with Tree of life print at the front. Concealed button closure at the back. 2" stitch-down tailored flange. Solid piece-dyed back. 140-thread-count slub cotton. 20" x 36". Machine wash. Imported.